Everyone in our house was ready for a "normal" routine this week. After two weeks of spring breaking we craved some normalcy. We didn't go ANYWHERE this week because it is regular Spring Break here. No piano lessons, no baseball, no piano teaching for me. I have to say it was glorious. We did Holy Week readings, composer study, cooking, went on nature walks, did some planting, oh - and I even got a mammogram. Oh joy. I took a lot of time to wrap my head around the fact that I will have a middle schooler next year (which won't be that much different than this year, really). I did start a Pinterest board about homeschooling middle school, so check it out! "When did I get to the point of orthodontists, mammograms, and middle school?" My children are growing up so quickly. I am immensely thankful to have the chance to spend each and every day with them. I've been struck this week with just how much my daughter is starting to blossom. She is taking on her own projects and becoming so much more independent. She had a lovely tea party for all of us on Sunday afternoon... even made chocolate milk for her little brother since he's not much of a tea drinker. Lots of seeds were planted this week, too (with dad's supervision). We planted a rather large garden last year, but this year I'm letting her do her own thing. Miss B also did some swimming at the YMCA this week, too. She's no longer on the swim team, but still likes to swim laps for fun. GMan's week was very productive. We did a lot of our work outside because it was just too beautiful to stay inside. He is working hard on cursive. I also have to say again how much we love Writing With Ease. I love the way it incorporates grammar, spelling, handwriting, literature and history. Both children learn so much from their short lesson each day. Susan Wise Bauer has a great article about the benefits of this writing curriculum. Read it here. After his space class at co-op he wanted to read the Magic School Bus Space Explorers chapter book. I love his thirst for knowledge. I learned about Story Cubes through Susan's blog, so I purchased them. They were a huge hit this week!! The kids just made up stories by themselves. All I heard was giggling and shouting. My favorite resource this week hands down is Homeschool Share. Did you read "A Delightful Double Existence"? We spent most of our time this week in Sherwood Forest! GMan worked this week on a LEGO robot that had to be at least a foot tall. His friend Zachary (you might know his mom at The Joys of Home Educating) and he participate in a challenge each Friday, then they share a video with each other of their creations. We also spent a lot of time this week learning about Frederic Chopin. I pulled out this listening map from my teaching days and we studied the Minute Waltz in depth. We also watched Vladimir Horowitz playing Chopin on YouTube. I'm such a music nerd. I talked to the kids about what a Polonaise was and showed them some of my Chopin music. Once upon a time I played Chopin all the time... I need to get back to that. 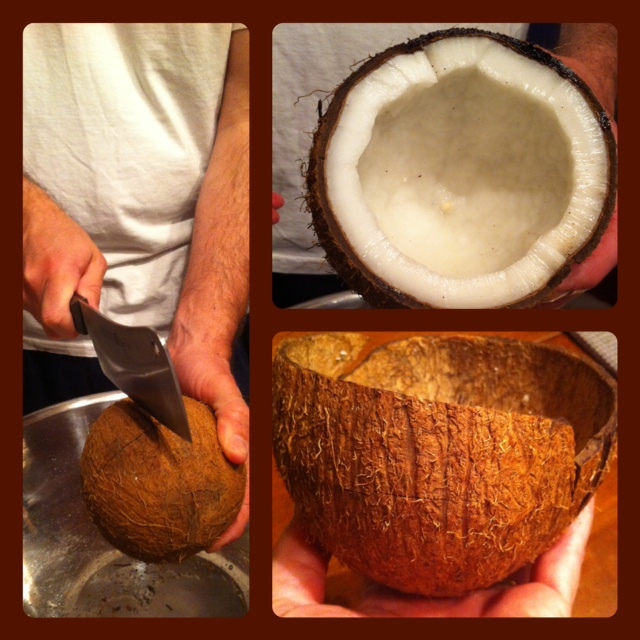 Finally, daddy helped crack open a coconut one night this week. This was a request from Miss B because in The Swiss Family Robinson they used coconut shells for bowls. She adored this book (you can read it for free on your Kindle) , and said she wanted to make the bowls herself. Can we say INTEREST LED LEARNING? It was shown to me this week that a little bit of structure and guidance from me, with a lot of leading by the children results in the most effective educational days. In thinking about next year I'm remembering to keep it simple and let my children dictate much of their education. I'd love for you to link your photo collage today! 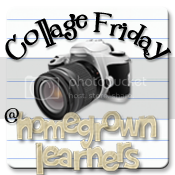 Enter your blog on the linky below and be sure to grab a button or mention Collage Friday somewhere in your post. Then, be sure to visit the other great entries! I want to leave you with this today. In the midst of everything this week there is one thing that is most important. We will go to Good Friday services tonight and leave the church in silence. Our hearts are heavy, but know the resurrection is near. Blessings to you this Easter weekend! Happily linking with Kris, for The Weekly Wrap Up and with Susan for Favorite Resource this Week!.